Riaz Ahmad teaches Mathematical Finance; C++ and Python programming for financial engineering applications; and Mathematical Methods based courses. He has been training in the financial markets since 2003, in London, New York and the Far East. The range of audiences he has taught include front office professionals and new graduate hires at investment banks. In addition he has delivered continuous professional development workshops for CFA charter holders in London and New York. He is an Applied Mathematician with teaching and research interests in both the mathematical and computational aspects of financial derivatives. In particular, stochastic volatility and jump diffusion models, exotic options, interest rate modelling and scientific computing. Recently he has been developing interests in Islamic Finance. At the MSc, MBA and executive education levels, Riaz has lectured in Mathematical Finance at Oxford University (Mathematical Institute), Lahore University of Management Sciences (LUMS) and Institute of Business Administration (IBA), Karachi. Since 2005 Riaz has been lecturing on a part-time basis in the mathematics department at UCL, where he delivers courses at both undergraduate and graduate levels as well as supervision of MSc dissertations. He has also facilitated for The London Mathematical Society on their Short Course Scheme for UK based PhD students. 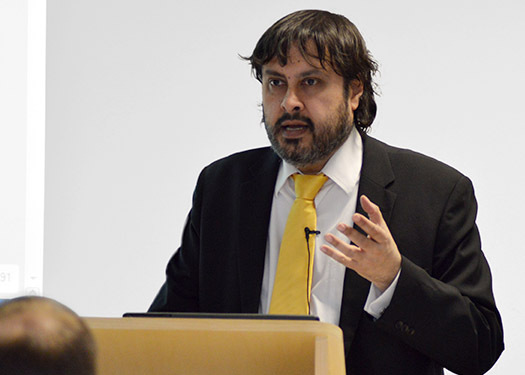 Riaz has extensive experience of curriculum design in both the financial markets and academia. At the university level, he has designed a specialist Computational Finance minor as part of a wider undergraduate degree programme in Engineering. Riaz holds the degrees of BSc, MSc and PhD in Mathematics from King’s College London, Imperial College London and University College London in turn. His PhD is in the theoretical and computational methods of fluid dynamics (flow at high Reynolds number) and completed under the supervision of Professor FT Smith FRS. In the past Riaz's academic research has involved applying mathematics, in particular, Partial Differential Equations, to model problems in physiological flows (arterial blood flow and vascular disease) and aerodynamics (turbulent spot formation). Since 2001 Riaz has been fully committed to problems in Financial Mathematics. During this time he has taught mathematical finance across all asset classes and derivative types. Riaz frequently talks at schools about the application of mathematics in the financial markets; and in a wider context, as well as opportunities for maths graduates. He contributes annually to the UCL widening participation scheme for A-level students.